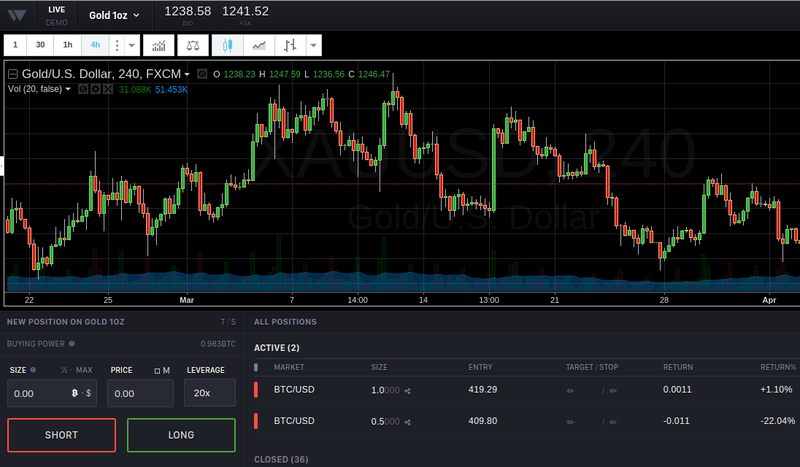 Check out the former fantasy trading platform WhaleClubCo's new product: BTC/USD CFD trading! 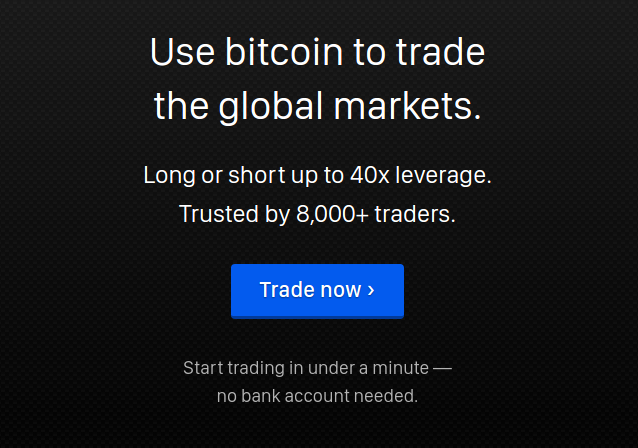 And now you can use bitcoin to trade Oil, Gold, and EURUSD as well! Their site has been around since 2014, but the "real" trading is new. 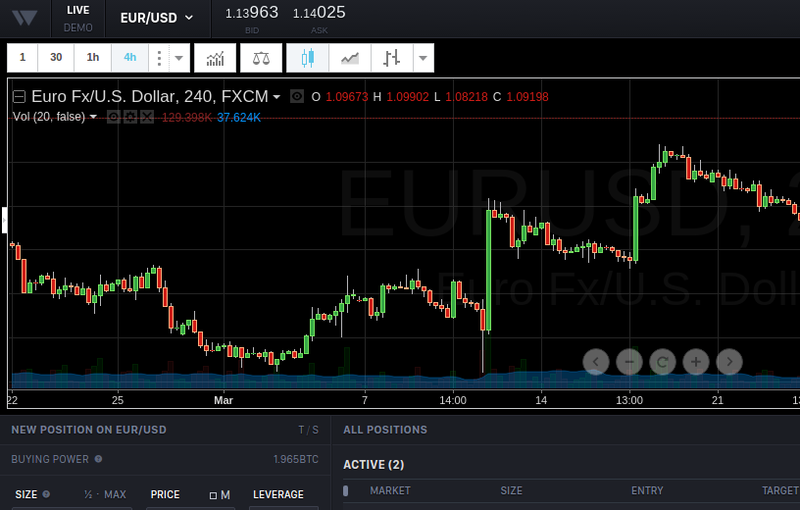 They have a Demo trading side for you to test strategies on. Use this link and get your first deposit doubled!. 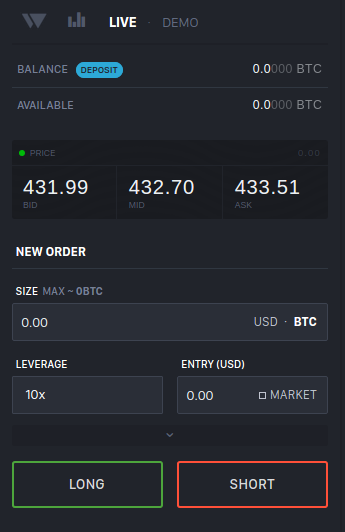 They allow you to adjust your leverage from as low as 1x if you want to take a boring trade, or up to 10x if you want to take on a little bit more risk. You deposit bitcoin and just trade it leveraged, with each of the positions isolated. Simply enter your price and you can choose a stop loss and target (take profit) as well. They source their liquidity from Bitfinex, Bitstamp, and OKCoin. So you're basically just using bitcoin to bet on where the general BTC/USD price is going. If the books are moving there, the price will also move on their platform. The other position, Gold, I put at 0.5 BTC margin at 20x leverage, so I was trading with 10 BTC buying power. This meant that I am down -30% because I was short at 1,222.46 and the price dropped 1.5%, which you multiply x20 for my margin profit and loss. Finally, Crude Oil at 10x leverage had 0.5 BTC margin down, and what a nice return! Almost 50%. The price movement was almost 5%, and my 10x leverage means I got a nice 0.25BTC return on my 0.5 BTC investment, in just days! Impressive how much you can make when you are calling the direction right. Just make sure you use strategies that have stop losses so you don't hang on to a loser for too long. So what are you waiting for? It costs you nothing, no risk, to jump on and try the demo site. If you like it, and want to try some LIVE trading, just deposit coin, and make sure you get your 100% deposit bonus, and start trading live and enjoy! Any questions or comments or problems? Always feel free to ask at @Bitcoin_markets on Twitter.